We are happy to announce that we have just released an IPv6 Address Lookup tool. This tool is aimed to complete our tool collection, which includes: IPv4 Address Lookup, Find Someones IP Address tool and Geolocation API. IPv6 addresses were introduced to fix the problem with the shortage of IPv4 IP addresses. It si considered that IPv4 addresses were already exhausted about 3 years ago. However, because the IPv6 are not that popular, they cannot be used alone. Many web servers does not have ipv6 support yet and the computers using only ipv6 won't be able to access. However, many Internet Service Providers started to assign IPv6 addresses to their users, as an alternative for IPv4, which are still used but usually shared along many computers. Here you can access the IPv6 Address Locator. With the latest situation created by NSA and their spying mission, the online privacy become an important aspect in our Internet Usage. 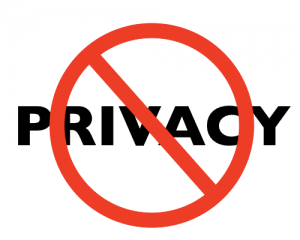 Although some can say that only if you do bad things you fear for this, online privacy should still concern those who don't and never plan do to something stupid. The problem is that the data is traced and then stored, and if someday you learn something about an important person, or you want to do something that some people won't like, they might search trough your online history and what you did online to find facts about your life would put you in a bad light with the purpose of dropping the issue. Another problem is that this data, as it was shown by Edward Snowden, can be accessed by almost anyone who is somehow related to the NSA. Getting back to public data that anyone can access, here comes the IP Address. While it is not that easy for someone to get the exact location based on your IP Address and find who you are, in most cases he can find out the city you live in. Is this a big issue ? In 99% of cases it is not an issue. Most websites are not interested in your location for other reason than marketing purposes: seeing where the most visitors are coming from to be able to provide better services. Website knowing your approximate location can also mean that when you go to a website you will be shown content relevant to your location without searching for it, for example weather websites, big online stores. But, there will be websites who can use your location to do things that many will consider bad, for example some websites might block your access to the website if you are located in a certain country or a certain state, based purely on their experience with past users from your location. This is considered discrimination and website owners should be charged for this. Websites can have different prices for people in different places ( based on the purchase power and average income ), that is also illegal in most countries. Despite there are legal actions against those type of websites who do such kind of things, the real problem here is if a bad intended person can do harm to you if he knows your IP Address. Well, since most websites keep this data private, if you visit a trap site building only for this purpose, he can watch your actions without you being aware of this. For example he gives you a link to an online survey and he ask you do complete it. You might not be aware but the survey is a trap site and he gets the results associated with your IP Address. I mean, you should not complete online surveys providing sensitive data unless you trust the source, but more creative guys can find ways to trick you into this. Maybe the question that anyone have is if someone can find you and "meet you" in person starting only from your IP Address. If the creativity on one side is at a certain level, and the ignorance is on the other side, then yes. There are public databases who shows the city an IP Address if from, and the Internet Service Provider. He might get some more data about you, maybe a photo or some habbits. If he have those the search might not be that hard and he can find you ultimately by associating data from phone books for example. If he knows your name then it will be much easier. However, there are many people who gives their information away on the Internet. Should you be scared of someone finding where you live ? Why would someone want to get to your house instead of emailing or phoning you before ? Journalists can be easily found and they are exposing others on a daily basis. If you really want to write something bad on the Internet about some mob boss you should know this and post anonymously ( there are many tools to hide your tracks on the internet ). What do you think about this ? Do you have any examples of situations when the city - IP Address association can really harm someone ? Getting the IP Address of someone can be a pain if you are not a tech person. Every pc have an IP Address and for every connection made to a server, site, chat system, the IP address is disclosed to the server ( unless there is a proxy used ). So, if you want to find the IP address of someone who you exchange emails, chat or discuss on facebook or a forum, the only thing needed is for him to connect to a server where you have access. Well, as I said, if you are not a tech guy than you are already confused. Let me put this in other words. Using our latest developed tool: IPGP Find IP Address , you can create a short link to a story, a youtube video, a picture on the internet or anything you like, that will be re-routed trough our servers and it will tell you the IP Address of everyone who visited that link. How this works ? When you send the short link to the person you want to find the IP Address, and he access it, he will be first sent to our server where we save his IP address, and then he is redirected to the story, facebook page, image, youtube video, etc. It is happening so fast that there is no way he could notice that anything happened. 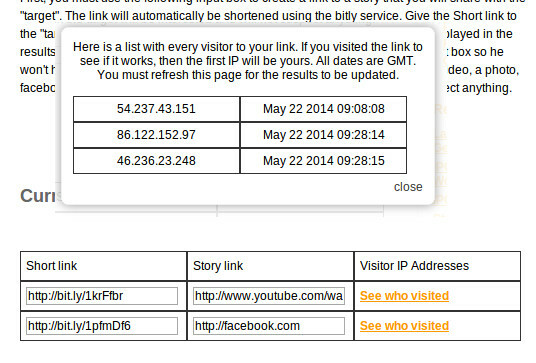 Then, you can come back to the application and to see who visited your link and their IP addresses. We are proud to announce that from today, at the user demand, the JSON version of the IPGP Geolocation API is now available. Since today, the data was only available trough XML. Application Developers can now have the IP geolocation data returned in a format which is more friendly with all programming languages. To get access to IPGP Geolocation and to get your API key you have to set up your subscription here: IPGP Geolocation API. 3 years ago we launched our IP Address Geolocation API. During this time we provided more than 10 billion results. We have constantly upgraded the service to provide better and more accurate details. Our API is very easy to use. The information is provided in XML format. The URL for accessing the API is: http://www.ipgp.net/api/xml/IP_ADDRESS/API_KEY . If you want to try IP Address Geolocation API, request your API key. Your data is very important. Not the program files that you can download whenever you want, but your important data: pictures with your kids and family, movie clips, important documents from your work. You may think that your data is unsafe on the Internet, that someone can steals your data or you can lose it, but let me ask you something: Is your data safe on your computer ? When you don't pay enough attention, someone can steal your laptop or access your computer much easier than he can hack a website where people are working dedicated to protect that data. If you let your computer open at work someone can steal all your data in 15 minutes or less, without effort. Data stored on cloud is safer than stored anywhere else, more, you can access it from anywhere and don't have to worry to sync your music files with your home and work computer, tablet or phone. There are many companies that offer you cloud storage for your data. To make sure you choose the right one you may want to read some cloud backup review of companies that offer cloud storage. Among the features that you might want to look when you buy a cloud storage are: Speed, Uptime, ease of use, technical support, customer care, reliability and money. I intentionally left the money as last criteria because when you talk about your data, the money are the least you want to think about. I don't want to ask you how your data is worth for you. You can rent a cloud data storage for as low as 4$/month. Is your data worth more than this ? To make sure you select the best cloud storage provider you can read some reviews on dedicated websites. On Top 10 cloud storage you can see which are the top 10 companies that offer cloud storage, top 10 companies that offer online backup solutions and top 10 companies that offer cloud servers. When dealing with private data, the security is very important for all. These companies are paying money to ensure that your data and your connection is protected, so no one can steal it. I liked windows XP, it was a good version of Windows. The problems at the start of the XP was terrifying, but with service pack 2 most of the problems were solved. Despite i like windows xp, let's face it, it is not getting any younger. Windows XP is losing popularity. 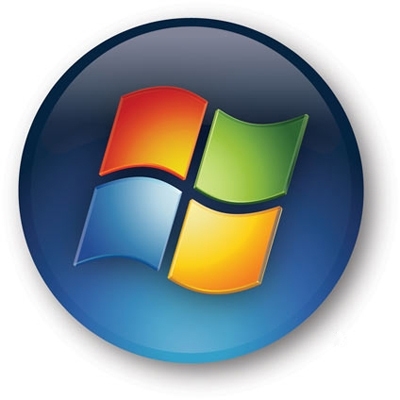 According to a poll i run on my site, 36% of my readers use Windows 7, and only 26% are using XP. The results of the poll may be not representative for the whole world, but they say something: Windows 7 is more popular right now. What happens ? The advantage that everything works on XP will go away. Software and driver developers will start to support less and less the "old" version of Windows and we will start to have problems. Is Moving from Windows XP to Windows 7 worth it ? Exactly 4 years ago, on 7 July 2006 Ipgp.net was created. I am very proud to see that it is still popular, and the signs that it is a grown-up website are so obvious. When it started there was only an ip lookup form. The loading time was about 30 seconds/query due to a heavy database and the results were inaccurate. Now, the website responds very fast, accurate results, map included. Now we have this blog too, an API for developers, simple widgets. I will drink a beer for Ipgp and i hope it will see significant improvements year by year. There are 5 visitors online.